Browser plugin that displays Exif metadata for images. Is there a better alternative to Exif Everywhere? Is Exif Everywhere really the best app in Image Editing category? Will Exif Everywhere work good on macOS 10.13.4? 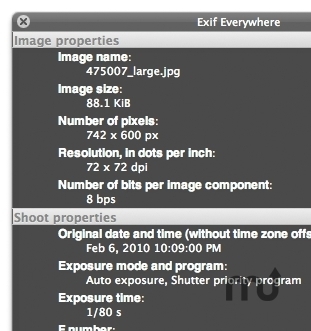 Exif Everywhere for Mac OS X aimed to display and strip Exif metadata, GPS geolocation and other properties of JPEG, TIFF and RAW images. It is a set of Safari, Firefox and Google Chrome browsers extensions and a Standalone Application. Exif Everywhere needs a rating. Be the first to rate this app and get the discussion started!